Now that I have finished taking pictures of my most recent model, it’s time for the hard work: editing with Photoshop. (I highly recommend Photoshop! You can get a subscription to the Adobe Photography plan if you don’t have Photoshop already. It costs about $10 per month, and it is worth it.) Once the images are done, I will create a new model’s gallery and add the images. In the 6 step-by-step videos below, I demonstrate all the steps I go through for Photoshop editing of jewelry models. Each video demonstrates a set of tasks, and I explain how I do them. If you are creating images for your website, these are some typical editing tasks you will likely need to know. Here are the Before and After images. The videos show I get from before to after. When we were kids, we would open paper clips, bend them back and forth, and see how long it took for the paper clip to break. We thought that by bending the wire repeatedly, we were making it soft enough to break. Actually, though, the opposite was true. When metal is repeatedly hit, twisted, or bent it becomes harder, which makes it brittle enough to break. This is important to understand when working with silver wire. Pure silver has all of its atoms in a lattice structure, much like crystals. With all the atoms lined up in straight rows and columns, the silver is very flexible and soft. This is why, for example, fine silver (99.9% silver) is not a good material for chainmaille. The rings won’t hold their shape and will open, causing the chain to fall apart. Before starting work on sterling silver chain mail, I always dip my pliers in Tool Magic. The plastic coating prevents the pliers from marring the silver. It also helps me keep a good grip on the rings so they don’t shoot out from the pliers. The Tool Magic coating gets raggedy after a while and needs to be reapplied-as seen in this video. Tool Magic only costs a few bucks, and it’s worth it. I am often asked, How do you remove tarnish from silver jewelry? There’s two answers: You can do it the wrong way, or you can use my recipe for a safe and natural tarnish remover. The other problem with creams is that they either do not get into all the holes, edges, and corners, or, if they do, they are nearly impossible to clean out later. Cleaning flatware or other food serving items? Those nasty creams have chemicals that are not good for you. If they are not completely cleaned out, you will end up eating them. Finally, if you have multiple pieces, like a handful of jewelry items, you have to do them one at a time. That’s a waste of time. The problem: People can look at pictures of jewelry online but can’t try them on to see how they look and feel when worn. The solution: Have pictures of the jewelry being worn. women to be the models. I wanted several models, with several outfits each, to provide a variety of “looks” for wearing jewelry. My thinking is that women could look at sample images the various models, think “Oh, that style is most like me,” and then see all the jewelry on that model. I ended up with four different models, and I’ll probably shoot a couple more to complete this round of images. Once I have a handful of new jewelry designs, I plan to repeat the process. For the last few months, I have been working on soldering jump rings for my chainmaille jewelry. I am bringing out a line of “heirloom” jewelry in which all the rings are soldered. In most cases, chainmaille doesn’t require soldered rings: the rings won’t open unless they receive a lot of stress. For example, I have been wearing my Full Persian bracelet nearly every day for almost 2 years, and I have only had to fix one ring near the clasp. However, with some of the designs that use larger rings in a not-so-dense pattern, the rings may begin to open over time, particularly if they get rough usage. The viperscale bracelet shown below has a big aspect ratio (AR 5.9), so the rings are not strong enough to hold up to long-term tugging or yanking. I had given one of these bracelets to a colleague, who wore it regularly. She is fairly hard on jewelry, and after 8 months, one of the rings opened and fell out. I first started thinking about soldering rings while repairing her bracelet. 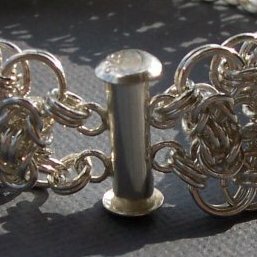 I have an order for a sterling silver Full Persian chainmaille bracelet, just like the one that I regularly wear. I didn’t have the jump rings I needed for the chainmaille bracelet, so I had to make some. That gave me a great idea: make a video so people can see all the steps to making jump rings for chainmaille. Chainmaille jewelry comes in a wide variety of quality. 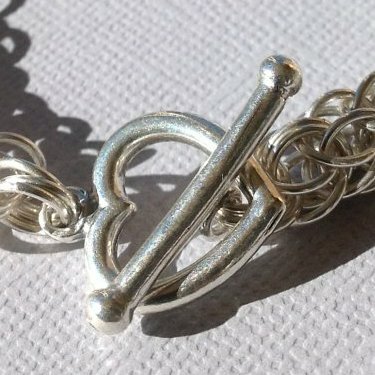 Some chainmaille jewelry exhibits high-quality craftsmanship, fine materials, and professional manufacturing techniques. Some chain jewelry shows sloppy work with little attention to detail and uses low-end materials. Most chainmaille jewelry is somewhere in between. 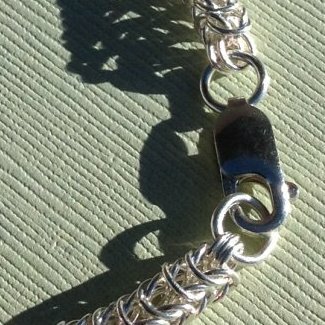 Here are some tips for making sure your sterling silver chainmaille bracelet stays in top condition for years and years. I have been asked many times about how to remove tarnish from silver, but I was recently asked how to make silver darker. I will show you how to darken silver by using boiled eggs. Some people like really shiny silver. Some people like silver that is darker, slightly tarnished, and antique-looking. I’m in the first group. I think highly polished silver is beautiful. If you are in the second group, this post is for you.